Not sure what to make of that quote, especially in the present context. (And is the idea really that outlandish? If Indians could elect Jayalalitha, why couldn’t the Egyptians have elected Fifi Abdou?). Anyway… This is one of my favorite Fifi scenes. Rise up, Egypt! 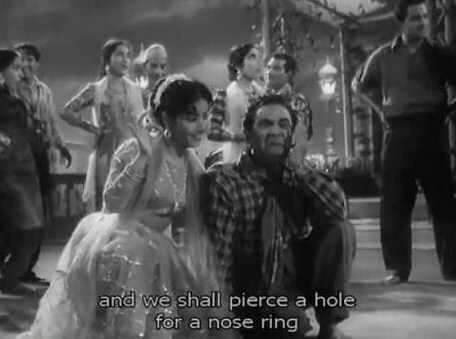 Going back into the Golden Era (yes, everybody’s had a Golden Age or Era – everybody’s had better times than they’re having now)… I really like this next scene for the atmosphere, the beautiful clothes and adornments (gorgeous nose rings! ), that precocious child Fairuz, and, of course, the great belly dancer Taheya Carioca. This next one is a charming, earthy domestic bit… The actress-dancer is Nadia Lutfi. 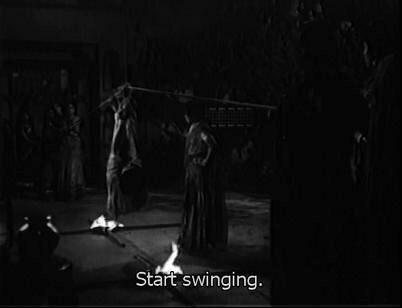 This is the greatest dancer of all, Samia Gamal, in something a bit different from her usual – more toned down, modest attire, also an earthy kind of scene… And very, very charming. 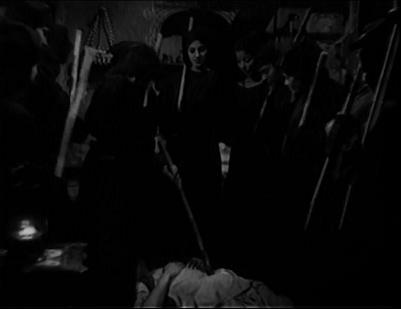 But both those other films, though they actually were made a little later, fail to develop the village girl gang concept anywhere close to the extent that Dillagi does, as they basically drop the girl gang altogether when seemingly more important things arise (such as ostensibly serious drama, or the introduction of a real woman gangster). 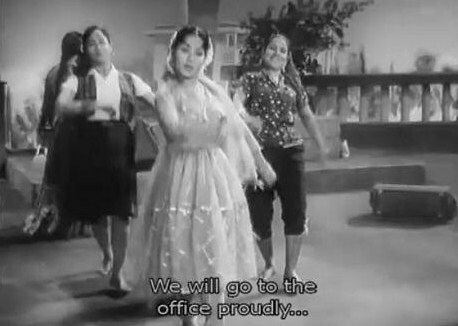 In Dillagi, the girl gang stays throughout the film, and they do very well at some tougher tasks that you wouldn’t normally expect from the village girl gang, such as exacting revenge or taking part in a little coercive persuasion, especially in their dealings with the villain. But that early scene also foreshadows one of the “games” they play with the villain, as they talk him into playing Blind Man’s Bluff so that he won’t be able to see them when they start beating him. Unfortunately, all of these actions combined do not stop the film from eventually having a tragic ending. (Not to spoil anything, but this is a 1940s film about lovers and a community that doesn’t want them to be lovers…so it won’t be too difficult to figure out who won’t be around anymore at the end.) But the games themselves, and especially the women who play them, definitely add a unique quality to Dillagi. 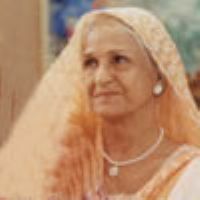 Kamini Kaushal – a fine actress, now one of my favorites (she secured that status in my mind just last week, when I watched Nadiya Ke Paar)… Born in Lahore, British India, on January 16, 1927… Co-starred with every one of the great actors of the Golden Age (see below), and was legendarily Dilip Kumar’s first famous flame (not that I care about all that gossip, of course ;) )… Also a former radio star and trained bharatanatyam dancer, and prize-winning toy maker(! )… And lo and behold, still thriving today. Q: You are 80, my god! A: It’s fun at 80. Gone through three generations, and still at it. Of course, things have changed. They always do. How can it ever be the same? . . .
Q: You’ve been witness to so many changes in the film industry. A: Yeah, look at them! Most of my colleagues are gone. 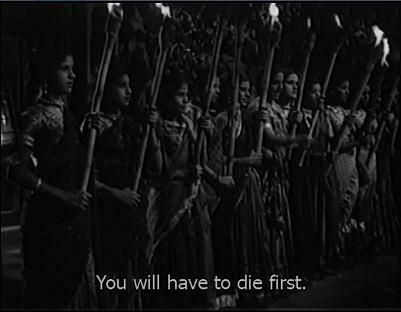 There’s no Nargis, Suraiya, Nutan, Meena Kumari, Raj Kapoor…you name them, they’re all gone. Yes, Dilip Kumar and Dev Anand are there. 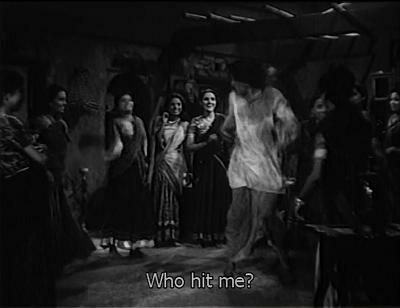 Q: And Manoj Kumar whose mother you played in the maximum number of films. A: That was during my third innings. I’ve had a very unpredictable sort of career. I’ve done what I wanted to do. Got married and left the industry when it was required and returned when it was okay. When I wanted to work, I did. When I was needed elsewhere, I didn’t. Cinema was never my be-all, end-all. When I worked, I did so with complete integrity. But work didn’t come above my family. For me, living a decent life is enough. Yes, I was passionate about acting, but not for the sake of making money. I like being creative. I love making toys as much as acting. Q: So the family was always your priority? A: You know, I’ve brought up five kids. . . . I continued to be creative from home. I designed so many toys, and won prizes. Toy making is as fulfilling as films, except that people don’t get to see your face. I don’t crave to see my face splashed everywhere. I once saw one of my colleagues literally adoring her reflection in the mirror. It was scary. I didn’t want that to happen to me. The temptation to become self-obsessive is very high in the entertainment business. Don’t get so sucked into stardom that you forget you’re human. Q: Some of your biggest hits as a leading lady were with Dilip Kumar. A: “Nadiya Ke Paar” was cute, like a little poem. Dilip and I got along very well. I shared an easygoing relationship with Raj Kapoor also. He was a prankster. We all had a whole lot of fun. Q: Are you impressed by the work being done today? A: Yes and no. Technically our films have really progressed, but the content is suffering. I’d like to see more content, but I’m sure youngsters feel differently. They aren’t aware of my films at all. To them it doesn’t matter whether actors from my era existed. Today’s generation knows so much. I grew up with a natural curiosity. Today’s generation have to grow up fast to face the competition. Q: Are you in touch with colleagues? A: When you’re working together there’s plenty of interaction. Some people maintain a permanent bonding beyond work. But I live in south Mumbai and the entire industry lives in Juhu and Andheri. To go to the other end of the city to meet friends isn’t possible. So I spend my free time swimming. I must do some exercise. A: Why? What’s wrong with it? Either I do yoga or swim. I don’t have any vices. P.S. As I may have mentioned at some point, I got interested in Nadiya Ke Paar at first specifically because of the great soundtrack by C. Ramchandra. And for anybody who wants to hear or download that music, there are some MP3s at India Baja. *Although the control of humans is crossing the sky, ‘nathna’ (nose ring) is not in currency today. Nathna means to control. Making an hole in an ox’s nose and taking a rope through it was called natha. The actual rope in the ox’s nose was called ‘nath.’ In the stages of gathering and hunting, our ancestors’ behavior was chiefly that of being a part of nature. Controlling animals through nose-rings began changing many things. -Putting nose-rings/controlling the ox, exploitation of the cow… This did not stop at animals. The owners of animals became the lords of slaves. -In nature, such related capacity of a woman is equal to that of many men. One man cannot sexually satisfy one woman…Therefore, ‘nathna’, putting nose ring. Continuous conflict within man and woman. There are no limits to doubt-suspicion-cruelty. It has been a synchronicity of weapon and text that nose-rings became the ornament of strength or power of market. It is the increasing weakness of man that is forcing woman also to become a wage worker. One politics of identity that places curtains on this reality presents it as woman’s empowerment…Becoming of woman as wage-worker is seen-shown as a step on the path of emancipation. People may have noticed by now that my favorite musical directors tend to be from the Vintage and Golden Age eras (and that my tastes continue to drift further back in time). 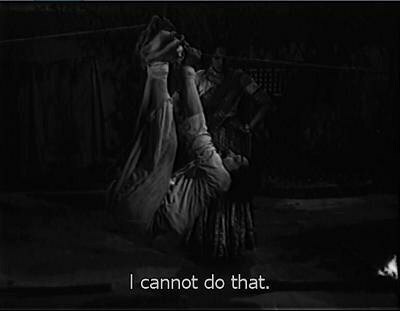 My fondness for classic Bollywood soundtracks, as with movies, begins to decline after the early ’60s. I do have some favorites in the early ’70s (Pakeezah, Mera Naam Joker…), but these films and soundtracks are the works of artists from the Golden Age. I find it more difficult to think of favorite material that came from artists who actually emerged at this later time. But there are exceptions, especially in music – i.e., composers who came up with songs that I find startlingly good, causing me to “rethink” the ’60s and ’70s, leaving me open to the idea that I might actually catch some of the love that other fans of classic Bollywood have for this era.